Cuklasovce was a curial village of yeoman's clan Cuklasovsky (Csuklasóczi, Csuklaszi) and their heirs. In 1352 yeoman Stefan from Cuklasovce is mentioned. Another Stefan from Cuklasovce was in 1514 and 1523 he was king's favourite person (he held an office as king's man). In 1532 Pavol Csuklazs (Cuklas) from Male Oponice had properties in the village. In the next centuries other yeoman's families are mentioned, for example Borcicky, Rybar (and Rybarik), Marikovsky, Kvasovsky, Kmeth, Ghilanyi and others. Joannes Minar, Nicolaus Mitussek, Joannes Serkovy, Stephanus Lacho, Michael Cservik, Andreas Minar, Adamus Minar, Michael Mlinar, Michael Csirik, Hrebos, Cserkovy, Stephanus Bednar, Joannes Kmet, Joannes Pallyo, Andreas Pallyos, Franciscus Szecsansky. It means in 1715 there weren't Snopek family in Cuklasovce and in Hungary kingdom there were just two People with name Snopek: Georgius Sznopek in Plavecky Stvrtok (in that years it was Cseötörtök) and in Zala district (southwest of Hungary) in village Polya there was Matheus Sznopek. On the website of Velke Drzkovce are the memories of old Slovak man from Amerika about Dolne Drzkovce and its ban. In his opinion bigger colonization in this area was on the begging of 18-th century what agrees with information in the previous paragraph (about small number of tax-payers) and what is more, this supports the hypothesis that Snopek family came to this area otherwhence (look at the section SURNAME). 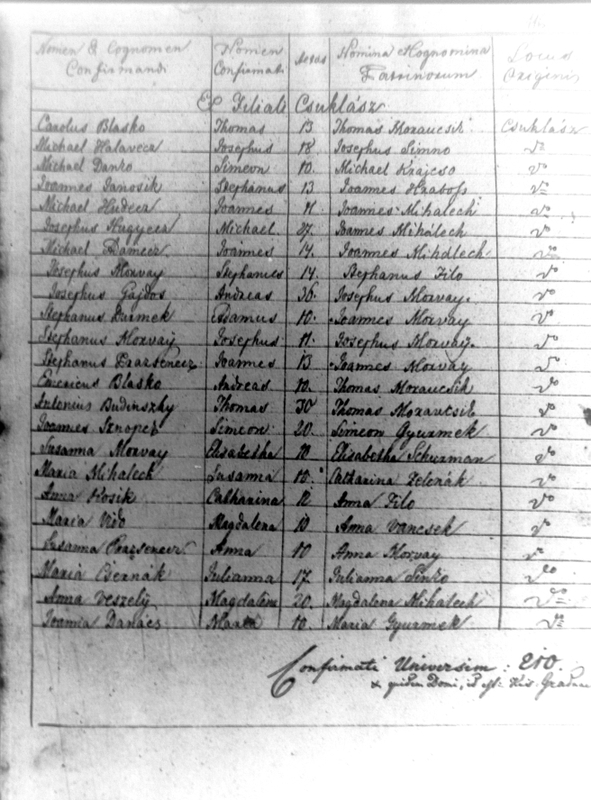 About the colonization speaks the occurrence some of Czech surnames in a parish register of Mala Hradna (for example Novotny, Varhanik, Cernak, Hrbacek, Jelinek, Hanak and others). Some of them have in their records written as area of root of descent Morava. According to archive documentes there were often arguments between villages Cuklasovce and Dubodiel. In 1581 Trencin County investigated the complaint of count Ladislav Popel because of land area arguments between the villages Dubodiel and Cuklasovce. In 1582 Ondrej Babindal lodge a complaint against Ladislav Popel, his wife and his officers because their serviles from Dubodiel violently occupied meadowlands and grounds in area of Cuklasovce. In 1610 took a place an examination of witnesses about controversial area between Dubodiel and Cuklasovce. After few years, in 1625 inhabitants of Dubodiel threathened villiens from Cuklasovce to do not invasions to area of Dubodiel. There were a lot of Turkisch attacks which were still in 17th century. From this area is famous an attack and dispersion of Trencin's soldiers by Turks in Jarky (Mnichova Lehota) in October in 1663. Turks probably came there through mountainside of Inovec Mountains to Trencin castle the way going through Tarabovec and Dubodiel to Trencin. They probably didn't reprieve the population of Cuklasovce during their wayfaring and rallys. After few decades the events of this region were strongly affected by anti - Habsburg uprising led by Francis II Rákóczi. The commander of Kuruc army was district administrator Mikulas Berceni who owned Tematin castle which was in Inovec mountains. The uprising braked out in 1703 but in 1708 in the battle of Hamre (the bounds) near Trencianska Tura Kuruc units sustained a smashing defeat. Rákoczi was wounded and he was wheeled through Mnichova Lehota, Dubodiel, Tarabovec and Zlatniky to Nitrianska Streda and Kovarce. After put down this uprising Kuruc deserters stayed in Inovec mountains who started loot. Then some hopeless villeins joined it too. Accorind to this unbearable situation common edict of Nitra County and Trencin County was issued. Because of this edict they had to liquid of crofts in woods, demount or burn frame houses and the settlers were moved to villages. In 1598 there were 18 yeomen's houses in the village, in 1784 there were 30 houses and 188 inhabitants and in 1828 there were 24 houses and 136 inhabitants. According to the work "Magyarország Geographiai Szótára", which was published in Pest in 1851 by Elek Fényes (Hungary statistician), there were 160 inhabitants of Roman Catholic religion and 14 inhabitants of Jewish religion. On 23th January 1767 there was an inventory of property of villeins. It was implementated by Maria Terezia. 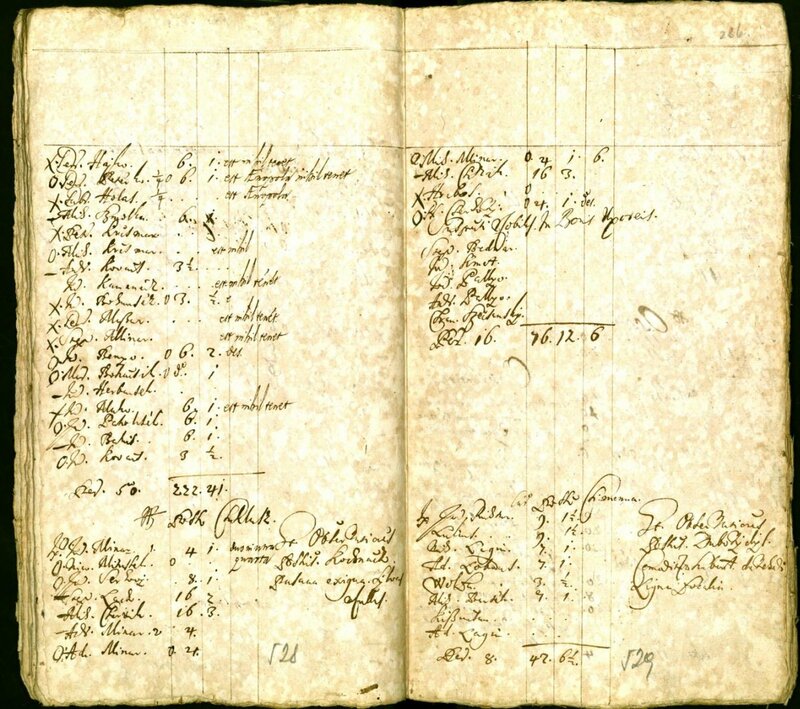 This inventory took a place in Cuklasovce in 1770. It was made by Juraj Hodossyi and Jozef Vagyon. Lieges answered to questions from nine-points questionnaire (scan - in old slovak language). From the questionnaire we know that just one third of the farmland was fertile and people made a livelihood from selling fruits. They transfered one ninth from everything what had grown to them and also their animals to their passator. Cuklasovce had a privilege that they didn't have to lead away one tenth of thier crop to the church. In the inventory there are these villeins: farmers Juraj Lacho, Juraj Mlinar, Adam Pristaš, Ján Pristaš, Ján Hudec, Michal Michalech, Michal Čičík, Ondrej Crho and paupers Ján Ďurkov, Ján Filo, Michal Adamec, Michal Bošňák, Juraj Šimko, Ondrej Kucharica and Ondrej Šimko. All superior Hungarian Kingdom was dunned by usual pandemic of plague and cholera. They were because of bad harvest or bad hygienic conditions at places where wounded soldiers were staying. Usually these epidemics were after ends of wars (for example in 1710 after uprising of Frantisek II. Rákoczi too). After revolution years 1848-49 local epidemics of cholera braked out on the area of Slovakia. In the parish of Mala Hradna 50 inhabitants died because of cholera - the most of them were in Neporadzka (14) and in Mala Hradna (15). In Cuklasovce there was no death in that year. - 24th October 1866 died Maria Zsovinecz, the wife of Adam Masarik (a wood-cutter (Cuklasovce 10) in the age of 25 - and this was the very last victim in the parish. 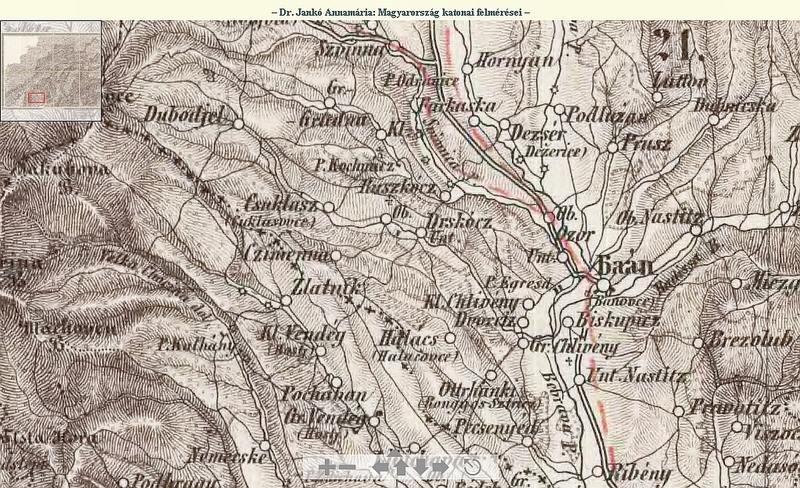 According to list of localities of Austro-Hungarian Empire from the view of administrative and religious division in 1877 there were 165 inhabitants of Roman Catholic religion in Cuklasovce (the parish Mala Hradna) and 23 inhabitantsof Jewish community (religious belonging to Banovce) - on the digitized photo on the bottom of appropriate page. Resource document: Dvorzsák János: Magyarország helységnévtára : tekintettel a közigazgatási, népességi és hitfelekezeti viszonyokra. = Ortslexicon von Ungarn: Mit Bezug auf dir politische und kirchliche Eintheilung der Bevölkerung. 1877. The list of tradesmen in Austro-Hungarian Empire in 1891 says in Cuklasovce these names: Benyo (1), Breeder (1), Brexder (1), Holbay (2), Mihály (1), Stáhl (2). From the total nuber there were 108 single people, 80 married people and 10 widows/widowers. For five people the mother tongue was Hungarian, for 7 people it was Deutch and for 186 it was Slovak. The knowledge of Hungarian declared 36 inhabitants. The knowledge of reading and writing declared 125 people. From the total number there were 186 inhabitants of Roman Catholic religion and 12 people of Jewish religion. From the total number of houses two of them were from stones and bricks, 35 of them were from dobes, 16 of them had roof tiles, 5 of them had shingles and 16 of them were covered by straws or reeds. People from Cuklasovce were farmers. It is mentioned that in the 19th century on the patrimomium of Borsicky the ground was classified to the third class of soil quality because of its acidity. This fact has affected the results of farmers up to this day. In 1808 Jan Morvay was born in Cuklasovce. Some source-books mention earlier year of birth (1795) and say that the place of birth was Drzkovce. Jan Morvay was from aristocratic family. His father was Jan and his mother was Frantiska (maiden name was Dvorecka). He finished studies of theology in Trnava (1828) and he became a parson in Dubnik (1840-1842). He belonged to Slovak national revival group "Bernolaks". In 1831 he translated to Slovak and published the handbook against to cholera. He was a tabular judge of Komarno County. By congregational list of nobility from Trencin County (from 1748) Morvay families belonged to yeoman family of Zahorsky wapentake (area of Banovce) and to proprietor of curia in Drzkovce too. 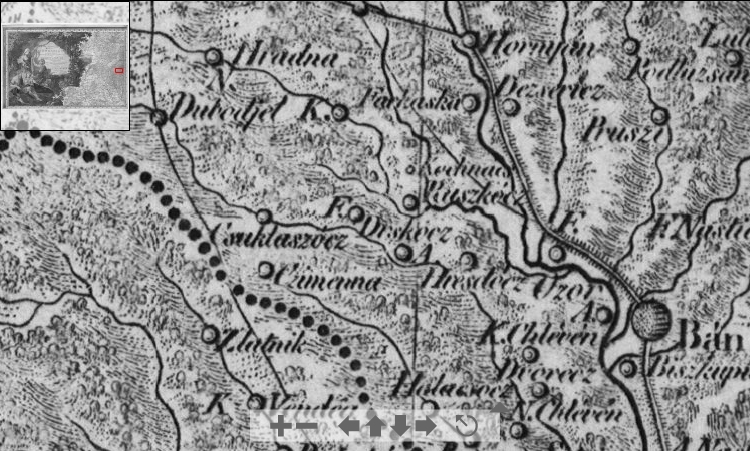 Cuklasovce and Drzkovce stayed like curial villages until the abandonment of villeinage in 1848. This fact had affected the symbology of these villages. Drzkovce made their own sealers in 19th century. There stayed epigraphical seals after them with elements of aristrocratic blazon. 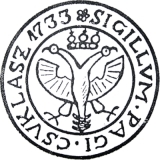 The sign of Cuklasovce pumps from the blazon of Habsburg family who were kings of Austro-Hungarian Empire from 1526 to 1918. In the village is a cultural monument - a bell-tower which works until nowadays. During the liquidation of guerrillas in November 1944 Germen ransacked for all surrounding villages and Inovec mountain. They were searching for guerrillas and reputedly hiding Jewish families. Germen resided in neighburing village Dubodiel where all men and boys from the age of 15 from surrounding villages (from Cuklasovce too) were called. Gestapo tortured them and examined them. Cuklasovce were exempted on 6th April 1945 with villages Drzkovce, Podluzany, Ruskovce, Mala Hradna, Cimenna, Dubodiel, Trencianske Jastrabie and Trencianske Mitice. It was during action made by armies of north part of 2. Ukraine front. In summer in 1951 Cuklasovce were tragic plagued by a flood. Intense cloud-burst made flood of water which deposited for example wood from courtyards which were terated to Inoves stream. Under the bridg this wood made a barrier to the water-course. Thanks this Inovec stream was bailed from his trough. During this flood 3 houses were destroyed: houses of Jan Petrik, Frantisek Petrik and Ludvik Mihal. A lot of animals died. Householders were without a roof over their heads and they were staying at school for some time. At the beginning of July in 1954 there was another flood but this wasn't so tragically. In 1970 there were 314 inhabitants in Cuklasovce. In 1976 villages Cuklasovce, Horne (Superior) Drzkovce and Dolne (Inferior) Drzkovce were compounded into one village Velke (Big) Drzkovce. According to parish administration the village Cuklasovce belong to parish of Mala Hradna. In 1782 was making a new parish Dubodiel becuase of earmarking of Mala Hradna from the parish. To the parish Dubodiel were associated Cimenna, Velka Hradna and Cuklasovce but because of disagreement of people from Cuklasovce this village wasn't associated. According to available datas in parish register of Mala Hradna on May 11th in 1842 there was a confirmation in parish church in Mala Hradna. He sacramented from bishop Imrich II. Palucky (Emericus Palugay de eadem Bodafalva) and sacrament receive 15 parishioners from Cuklasovce at all. The next confirmation was On October 2nd in 1860. He sacramented from bishop Augustin Roskovani (Augustinius Rosskovanyi) and sacrament receive 210 parishioners at all and 23 from them were from Cuklasovce. Cuklasovce - by a click you open the picture in its original size. My uncle, Stefan Snopek, wrote his memories about Cuklasovce and Tarabovec in the time of his youth. If you want to you can read them here (only in slovak language). Digital snapshot of census from Cuklasovce from 1715. Individual columns: a surname of taxpayer, quantity of ground and tilth ground from this, meadows and wineyards. Measurements are "jutro" (cca 0,42 acres). Click on full view. Čuklasovce on the map of Hungary Kingdom from the Slovak cartographer Jan Lipsky in 1806. Click on the image to full view. Full map (area of Trencin County) is available here. Čuklasovce on the map of Hungary Kingdom (1858) by 2-nd military mapping, compiler Jankó Annamária. Click on the image to full view. Full map is available on oldpmaps.geolab.cz.